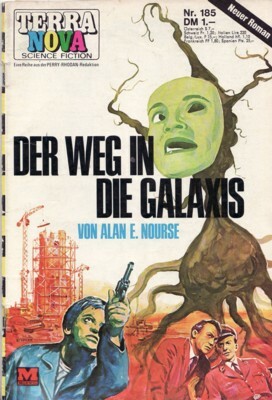 First german edition ("Neuer Roman" is stated on the cover, "Deutsche Erstveröffentlichung" on p. 5), first (and likely only) printing. The copyright is assigned for the year 1967 to the author. Day of publication from the weekly publication schedule; also this publication and Perry Rhodan #515 share the same ads on their respective pages 66, their inside back cover & back cover pages (and widely identical small ads on their respective inside front cover pages). The cover artist is not credited, but is identifiable from his signature 'STEPHAN'. Other prices: S 7 (Austria), sfr 1.20 (Switzerland), lit 220 (Italy), FF 1.80 (France), hfl 1.10 (Netherlands), F 15 (Belgium/Luxemburg), Pts 25 (Spain).